When I look at a big bowl of freshly dug hopniss, I think of what might have been, and what may yet be. Hopniss, if you’ve never heard of it, is the North American answer to the South American potato. 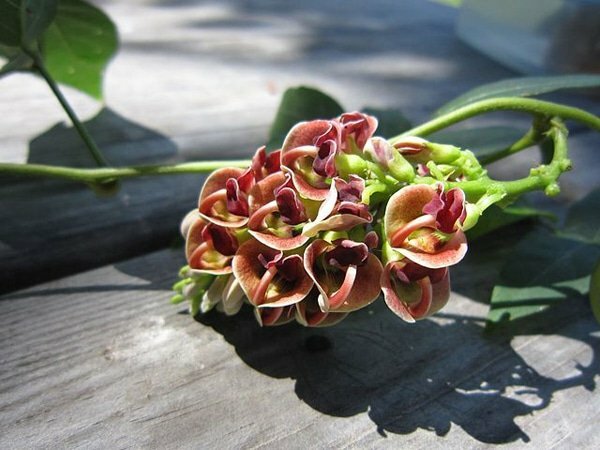 It is a tuber from a bean plant, and yes, you can eat the beans and flowers and shoots of hopniss, too, just the way you can with regular beans. But the tuber holds the most potential as a serious food crop. Openauk is only one of many names this plant possesses. Apios americana is what we’re now calling it in starchy Latin binomials, but it’s also known as the American groundnut — ironic, considering that the actual groundnut, which we call peanuts, is also of American origin — the vine potato, ground bean, and a host of lesser monikers. My friend and colleague Sam Thayer likes the hopniss name, and so do I. It’s clear, short and pretty. Native to North America east of the Great Plains (although it can be found in a few spots as far west as Colorado), hopniss likes to be in wet places: streambanks, lowland forest edges, pond edges, etc. That said, the plants are drought tolerant as well; a nice trait to possess in this uncertain climate we’ve been experiencing lately. Hopniss will also grow in gardens, as I have been doing since 2011. The reason it’s taken me so long to write about Apios americana is the primary reason you don’t buy hopniss in your supermarket: The tubers, to be of any decent size, need two years to mature. That is simply too long if you are growing for the market. 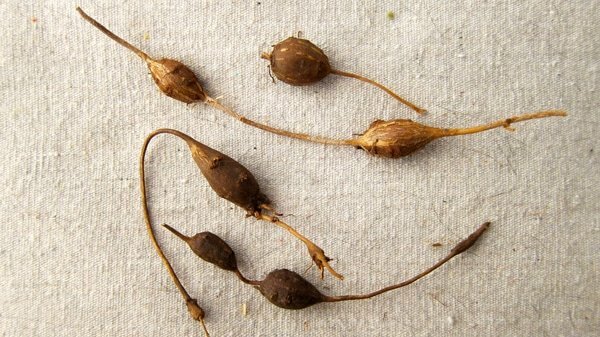 Hopniss tubers also grow like a string of peanuts along the root system of the plant, and can be found yards away from where the plant is growing. Another problem if you plan on growing them en masse. Sam, like most Eastern foragers, prefers to forage for hopniss rather than grow it for precisely this reason. He can harvest a bushel bag in a couple hours from the wild, needing only a shovel and the knowledge of a good spot. Hopniss are easy to spot when they are growing. They basically look like any bean you might encounter in a garden, and they smell beany. As they are perennials, you can spot older plants by looking at the leaf stems: Older plants have more leaflets on that stem then younger ones. If you can trace a vine back to the soil, the vine will be thicker at the soil line in older plants, too. Late in summer and in early autumn, hopniss sports gorgeous, edible flowers. Those flowers become beans, which are edible if you cook them. Like most beans, both the beans and the hopniss tubers contain protease inhibitors, a sort of “anti-nutrient” that steals nutrition from you if you eat them raw. So cook them, OK? It’s the tubers you want, though. And here’s the first advantage of hopniss: You can harvest them pretty much whenever the ground is not frozen, although most sources say they are sweetest in late fall and early spring. February is a perfect harvest time for them here in California. A typical hopniss tuber is, as Harriot mentioned 425 years ago, about the size of a walnut. That, mind you, is a two-year-old tuber. They get bigger, though, and Sam Thayer has found a few larger than the largest potato. Who knows how old that one was! 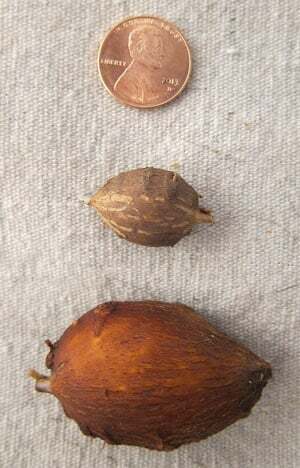 In my garden, I keep tubers larger than an almond and return the smaller ones to the ground, where they will regrow. How to eat them? Look first to the Indians. Virtually every native group living where hopniss lives used the plant in some way, shape or form. The Cherokee liked the beans. The Menominee cooked the tubers with maple syrup. The Dakota used them like potatoes. Some sources say to peel the tubers, but I find this is only necessary with really big, old tubers — you can eat those skins, too, but they’ll make you farty. I also tend to peel the tubers because I like their pretty ivory color. What are they like? At first taste, they are remarkably close to floury potatoes like Russets. The tuber is a little drier than a potato, quite a bit sweeter — but nothing like a sweet potato — and has a definite beany quality. It really is a bean-potato. Hopniss is denser than a potato so it will require a bit longer to cook. I find that typical tubers take about 30 minutes to get to the “easily mashed” point. They do not reheat well, however. Reheated hopniss gets gluey and gummy. You can (and I have) however eat leftover mashed hopniss at room temperature and it’s fine. Apios also fries wonderfully, making some of the finest potato chips or crisps you’ll ever eat. 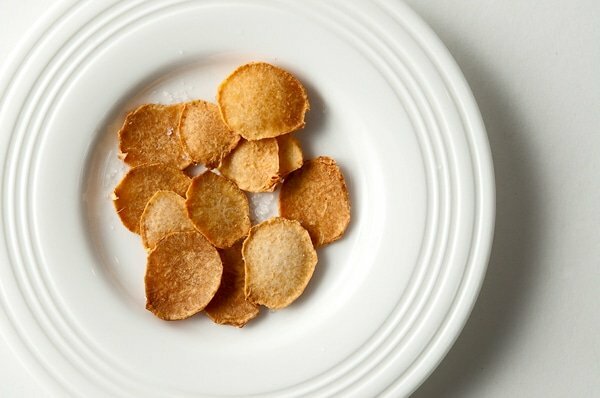 Because they are drier than potatoes, they cook fast and crisp easily. Cut them a little thicker than you would a potato so they don’t dry all the way through. And make sure to salt them the second they come out of the oil or the salt won’t stick. You can also dry the tubers to make a sort of flour. Both the Mohegans and the Delaware Indians preserved hopniss; hopniss, incidentally, is the Lenape world for the plant. I didn’t peel my tubers when I made flour, so it took on a warm gray hue. To make the flour I sliced the tubers into discs and dehydrated them completely. Then I put them into my Vitamix blender and kicked the spurs to it. Instant flour. If your blender is not so muscular, you might need to grind it in some other way. You can use this flour in any number of ways. The Delaware Indians used it to thicken soups and stews, and it works like a charm. 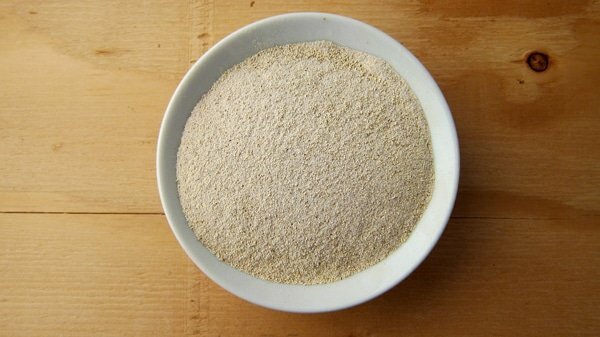 Hopniss flour absorbs a huge amount of water by weight — far more than wheat flour. In this respect it’s a lot like potato flour (which is not the same thing as potato starch, so be careful when you look up recipes). But if you think about it, hopniss flour is every bit as much a bean flour as it is a “potato” flour. So use it where you might use chickpea flour, such as in an Italian farinata. 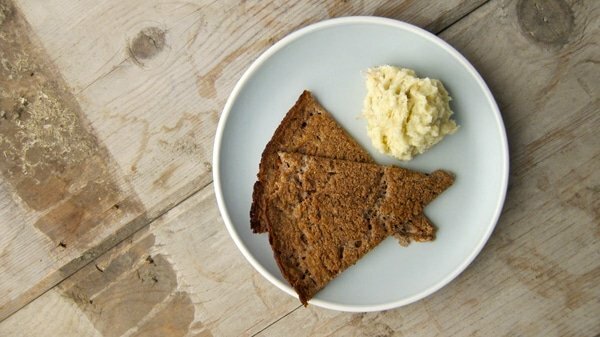 This is a hopniss farinata with a hopniss skordalia to serve next to it. 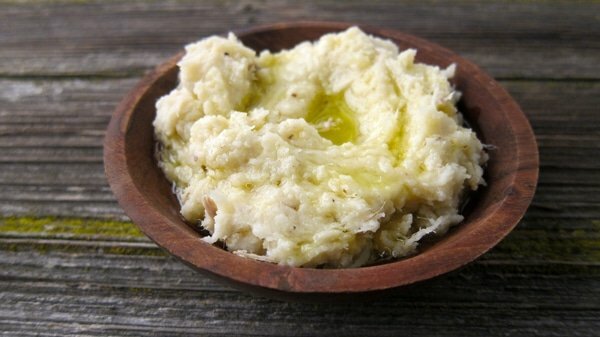 Skordalia is a Greek dip made from potatoes and garlic, oil and vinegar. It’s basically really loose garlic mashed potatoes with some vinegar. (Recipe follows) Done with hopniss, it’s spectacular. The farinata are good — they taste like the crust on wheat bread — but they need the skordalia to be a real treat. For now, the only way you will get your hands on hopniss is to forage or grow them yourself. And if you grow them, it will be a long, often frustrating endeavor. But it may not be like that for long. For a brief, shining time, scientists at Louisiana State University worked to improve yields and tuber set on Apios americana. It worked, and they got up to 7 pounds of tubers per plant in one season. But sadly, that research ended and has only recently been picked up by the plant geeks at Iowa State University. Slowly, improved hopniss tubers are becoming available. My great hope is to see hopniss become more widespread. It is more than just a potato substitute. It is a world-class food plant that happens to be native to the United States. And that’s a good thing. Do deer eat the green plants too. We have deer which prevent us from growing Hosta and Echinacea and several other plants. From what I read, ‘our’ deer are less fussy and eat more types of flowers than some deer.